1) Recycling should be made as easy as possible so that it becomes second nature. Set aside a space for your own recycling center and make sure everyone, down to the smallest tyke, uses it. Buy products with easily recycled packaging. Try to avoid containers that are made of combined materials (cardboard and plastic for example). 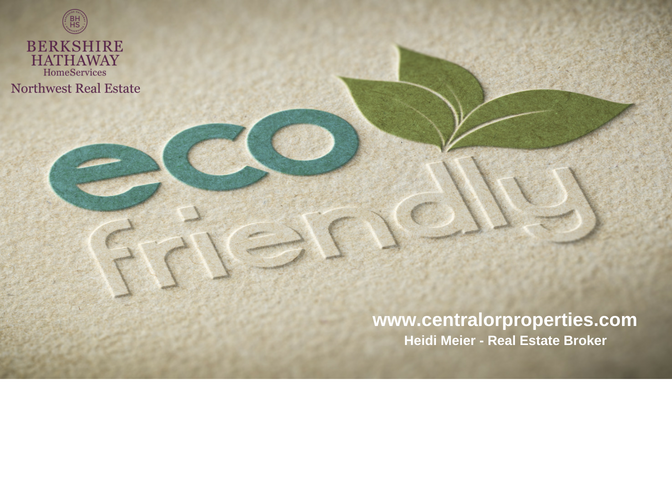 2) Buy eco-friendly cleaning products. Better quality and less expensive than in the past, these products can be found right in your neighborhood grocery store. Stay away from products that contain chemicals like petroleum, which take a hefty toll on the environment. You can even make your own, with safe ingredients like baking soda, vinegar and olive oil. 3) Compost! Keep a coffee can under the sink to toss vegetable peels, egg shells, coffee grounds (but no animal products!) Use the resulting mix for fertilizer in your garden. 4) Use fluorescent light bulbs instead of incandescent bulbs. Fluorescents last three to four times longer and have a lower impact on the environment. 5) Redecorating? Choose paints that contain low volatile organic compounds (VOC). These paints won't off-gas or produce noxious smells. 6) Instead of vinyl flooring, consider using stone or other more durable materials that have a longer life cycle. 7) Clean your heating and cooling systems annually to make them more energy efficient. 8) Weatherproof windows and doors to keep out drafts and lower energy costs. 9) Quit smoking. Second-hand smoke is a major indoor air pollutant and health hazard. When you quit, both you and your family will lead longer and healthier lives. 10) Don't use pesticides/herbicides on your lawn. Along with nitrogen fertilizer runoff, these are major water pollutants. 11) Keep your cat indoors. Domestic cats kill more than one billion small birds and animals every year (one outdoor cat averages 40 kills per year). They upset natural predator/prey balances and eliminate ground nesting birds. 12) Lower your thermostat in the winter. Raise it in the summer. Save energy and reduce pollution in the process. 13) Dispose of old paint, chemicals and oil properly. Don't put batteries, antifreeze, paint, motor oil or chemicals in the trash. Use proper toxic disposal sites. 14) Plant a tree. They store carbon dioxide and “scrub” the air. 15) Wash dishes by hand in a basin, and then use the dish water for outdoor gardens. 16) Plan to run all your errands at one time to save gas and cut pollution. 17) Collect rainwater and use it to water your plants. Chlorine in tap water sometimes fades their green color, and fresh rain water will also make plants more pest resistant and healthier. 18) Use as much natural light as possible. Everything looks better and is in tune with the sun's cycle. You can always close the blinds if you want to sleep late or take a nap. Try to bring in reflected light so direct sunlight doesn't fade or degrade materials and furniture. 19) Maintain as many plants and trees as possible both inside and outside your home. They keep you in touch with nature and help take toxins out of the air. 20) Take a canvas bag or two with you to the grocery store to cut down on wasted plastic and paper. 21) When buying clothing or fabrics, choose organically grown cotton or natural wool. Products made of these fabrics are healthier for you, your home and the overall environment.